If your parents were captured by the Armada, you will discover an old family friend along your travels through the Skull Island Skyway. When you first meet Gaspard he is imprisoned in the Monquistan Spice fortress known as The Presidio. He becomes a member of your crew, with the blessing of the Frog Father, as a Guinea Pig Guard. You can learn much more about his abilities and skills from Pirate101 Central. As you level up your companions they will occasionally reach epic promotion opportunities. 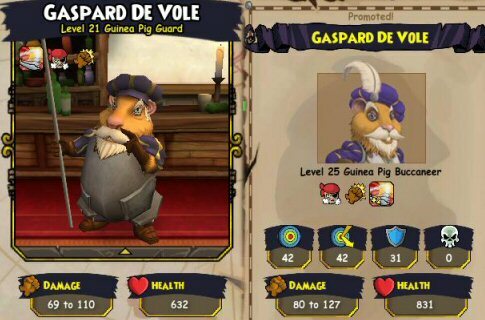 Gaspard’s first epic promotion occurs when he is promoted to Level 21. Find the nearest tavern and hear his tale. He will explain that he served on Alonzo’s crew for many years, searching for a legendary treasure known as the Golden Frond. Which is a Holy relic from Monquista. If you help Gaspard to help his old friend, you will be cut in for a share of treasure. To begin your journey, you’ll head off to Scrimshaw and visit the barkeep at the Hole in the Wall Tavern. So get sailing. In Scrimshaw find Barkeep Bardolf. He will tell you that Alonzo headed off to Puerto Mico and left word for you meet with Hector Garcega. Bardolf will give you directions and you’ll be off again. Now things get a little dicey here in Puerto Mico. It’s obvious Hector isn’t as friendly as the Barkeep made him out to be. He tells you Alonzo is off purchasing supplies, but asks you if you know what they’re looking for. When you tell him the “Golden Frond” it becomes clear that you know too much. About then a not so nice Monk will step in accuse you of something and mention the Monquisition and a battle ensues. When you dispatch with these fine fellows you’ll learn that Alonzo is being held in the Santa Juana Fortress. Head off to the main square where the shop vendors are. On the opposite side of the docks you’ll find the entrance to the Fortress. You will do battle with a few of the Fortress Guards which shouldn’t be too difficult for you. Free Alonzo and he will tell you that the Golden Frond was in the position of the great Monquistador Aldo Naranjgo. The Holy Church knows what happened to Aldo, but no one else does. Can you find out what happened? Gaspard reminds you of the friendly Monks you meet in Monquista and they should be able to tell you what happened to Aldo. So your off on long sail once again to St. Bono’s Abbey. At the Abbey Prior Andreo tells you Aldo Naranjgo is a mighty name, with a mighty history. When he started asking tough questions, the Monquisition sent him on an impossible mission to avoid the scandal. He left for Skull Island and the ancient tunnels near the Monquistan Stormgate. He was never heard from again. With the story told, Ratbeard jumps in and tells you “Sounds like the lair o’ the Scurvy Dogs! Seems there’s a treasure waitin’ there for us!” And off you go back to the Tradewinds Skyway to explore the Dungeon Entrance. You can avoid battles in the dungeon of course. 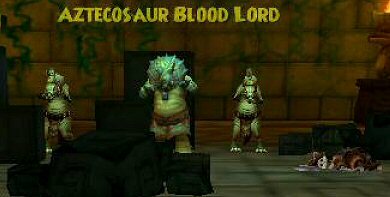 Stick to the edge of the tunnels and head to the Chamber of the Frond where you’ll defeat the Aztecosaur Blood Lord. Inside the Chamber focus all your attacks on the Blood Lord first. With him out of the way, the remaining mummy’saurs will be easily defeated. With the Aztecosaur defeated you can turn your attention to the skeletal remains of Aldo Naranjgo. In addition to possessing the Golden Frond, he also has some impressive armor. Gaspard suggests taking the treasure and the late Monquistan who deserves a proper burial. Collect his body and the Frond, then head over to Scrimshaw where you’ll find Alonzo back in his home. Evidently somewhere between the Scurvy Dog Hideout and Scrimshaw you find a place to bury the bones. You don’t actually do that, but I don’t think he carry his skeleton around for the rest of your travels either. Over at Alonzo’s house you give him the Golden Frond. He thanks you and tells you not to let Gaspard go, he’s wonderful and loyal crewman to have. Your task done, it’s time to celebrate in the nearest tavern. In this case, head down to the docks and pay a visit to Hole in the Wall Tavern. I’m sure Barkeep Bardolf will set you up nicely with some tankards of Yum. During your celebration Gaspard thanks you for helping him serve his old captain once more. He outfits himself with Aldo’s old armor that really does fit him rather nicely. 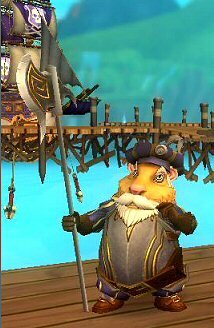 Thanks given, Gaspard takes his promotion from a Guinea Pig Guard to a Guinea Pig Buccaneer! Gaspard’s next promotion will come when he reaches level 47. At this level he will take the opportunity to become a Guinea Pig Mercenary. 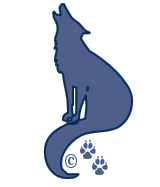 My Gaspard has a bit farther to go before he reaches this level. But as soon as he does, I’ll update his Quest page. This entry was posted on June 30, 2013, in Game Guides and tagged companion, crew, de, game guides, game hints, games, gaspard, Kid friendly, kid safe, locations, online, Pirate101, Pirates, promotion, quests, role play, Skyways, spells, vole, Windlanes. Bookmark the permalink.